After a stunning show from Coldplay last night (Tuesday), Wilco is the next band to take to the Live on Letterman stage. You can watch the whole show live online tonight at 8pm EST/5pm PST on CBS.com. Last.fm Trends explores how Wilco’s sound has shaped up of late and what fans can expect from the very special set. Wilco’s career has been marked by critical acclaim, turbulent label relationships and some stunning records, but one thing remains a constant; they boast a dedicated and passionate fanbase who have lapped up Tweedy, Stirratt and co.’s indie rock for more than 16 years. The graph below shows how they’ve been performing among their Last.fm listeners since the start of the summer. 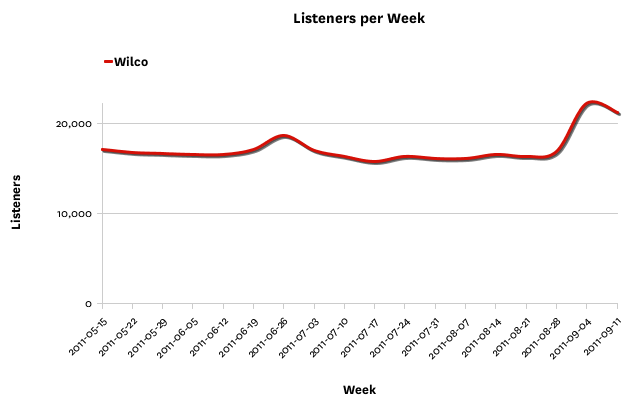 Wilco’s fanbase is often pretty stable, with around 17,000 listeners a week from their 881,186 listeners on Last.fm. Until June that had been gently declining, but the release of single “I Might” led to a bump in scrobbles through the month. Then in September, as new album The Whole Love was previewed on Wilco’s website and on NPR, their scrobbles climbed by around a third, pushing them to the 23,000 listeners per week mark. With the full release due next week the Trends team expect that to shoot up again. Right now, “I Might” tops Wilco’s charts at Last.fm. It’s a strong showing for the track, as the graph on the right shows, as it stands against older favorites like “Kamera” and “Jesus, Etc.” from their best-selling album Yankee Hotel Foxtrot. Tonight’s show promises to mix up old and new, and it’s going to be a great experience for longtime fans and newcomers alike. Watch Wilco Live on Letterman, in a CBS.com online concert exclusive, live from New York’s Ed Sullivan Theater on Wednesday, Sept. 21 at 8pm ET / 5pm PT. This entry was posted in Music and tagged Live on Letterman, webcast, Wilco Live on Letterman. Bookmark the permalink.